We took a train from Seattle to Spokane and bike back to Everett last fall. 363 miles and 16625ft climbing. Our itinerary was: Spokane to Wilbur (camp), Wilbur to Bridgeport (camp), Bridgeport to Twisp (friend’s house), Twisp to Newhalem (camp), Newhalem to Everett (banya); a SoundTransit bus back to Seattle. We were originally planning to take a train from Mt Auburn but about a week before the trip, Amtrak called us and told us that the bike car will not be available (out of order), so we decided to bike to Everett, with the goal of ending the trip at Downtown Banya (but it happened to be closed!). We also originally planned to take a train to Ephrata but the station does not have a baggage/bike service – by the way, now many (if not all; including Empire Builder) Amtrak trains have bike racks, so we didn’t need to box our bikes! Some people said that their bikes were not in good shape after arriving but ours were just fine. * Grand Coulee Dam was really impressive. They have documentary film showing starting at 3PM but if you ask, they’ll play them even before then. They also have a walking tour but it starts on the other side of the dam from the visitor’s center and we didn’t have time to do the tour. Next time. 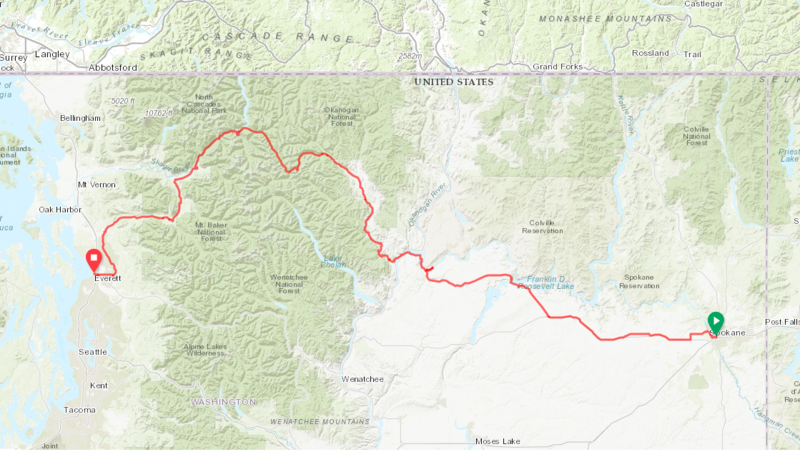 * It’s pretty flat from Spokane to near Grand Coulee Dam (steep hill warning near the visitor’s center!). Then, very gradual climb to Mazama. Then, the climb gets just a bit steeper to Washington Pass. 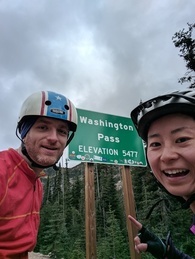 And just as you start to forget about the pain of climbing as you go down the hill, there’s a surprise pass “Rainy Pass”, where it actually rained a tiny bit. * The weather was sunny on the eastern side and cloudy on the western side. A bit chilly, especially at night. I wore my long sleeve shirts and leggings while biking and down after arriving at campsites. * Cinnamon Twisp had some delicious baked goods. * Most campsites were either closed or no service only, so I’d check the parks website for availability. Even though the Newhalem campground was marked as no service, we did have water. * As always, state park campgrounds were great. We had a wonderful view of the mighty Columbia River from our Bridgeport State Park campground. The fire ban was just lifted, so we were able to make fire at both Newhalem and Bridgeport. The RV park we stayed in in Wilbur was cute; they had a pizzeria, so we shared a whole pizza with everything on it. * We saw lots of salmon going up the river by the Newhalem campground! 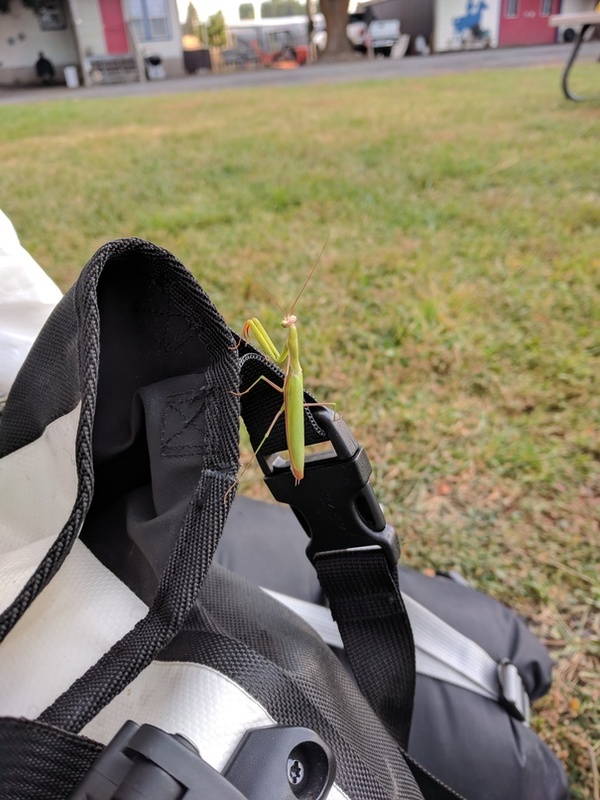 * At one point, a praying mantis decided to hitch a ride on Mako’s pannier. * Some logging trucks, which smelled wonderful. During our last long ride in WA, we were passed by a bunch of apple trucks, which also smelled good. Of course, biking near these trucks feels a little scary but when we were ascending, they were not going fast either, so it was ok.
* The descent towards Diablo was breathtakingly beautiful. * Pretty good shoulder space for much of route 20. From ~Marblemount, we took a back road (Rockport-Cascade Rd), which had very very few cars. We rode for almost an hour without seeing a car. Not many toilet stops after Marblemount before Darrington. Also, the trail near Darrington was dirt, so we skipped it. * I wasn’t chased by any dogs during this trip. * We stopped at the site of the memorial for the 2014 Oso mudslide. * Going into Everett from the Centennial Trail involves some steep hills. We’ll try an alternative route through the residential area next time.